On Oct. 12, the entire Harker community united at the middle school campus for the Harvest Festival, held each year to draw together families, faculty, staff and alumni in a fun setting. 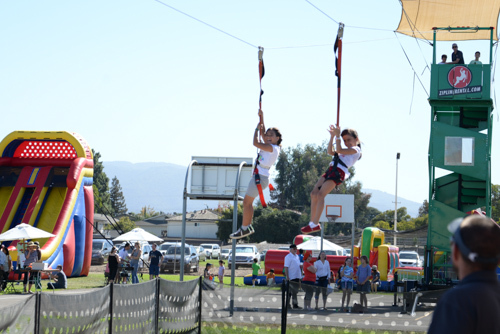 As in past years, attendees played carnival games, enjoyed a variety of foods, watched performances by Harker students, renewed past friendships and made new friends. This year’s festival was capped by great news about the events center fundraising effort, which exceeded the $20 million goal and raised $25.4 million. Festivalgoers had no shortage of activities to choose from. Some headed to the field for time-honored classics such as the sack race, while others enjoyed a round of laser tag, which featured an improved arena with more obstacles. The silent auction was also as popular as ever, with a wide array of prizes, from wine tasting trips to boogie boarding lessons to premium seating at a 49ers game at Levi’s Stadium. This year’s raffle was improved to offer entrants more opportunities to win prizes by having students sell tickets at every school event leading up to the festival, including Homecoming. Prizes included gift cards to local businesses and eateries, fashion accessories and free dress days. One of the biggest attractions this year was Witch’s Flight, a 300-foot long zipline ride that enticed thrill-seekers throughout the day. Riders hollered with delight as they flew across the air 30 feet above the festivities. Elsewhere, attendees partook in the many food choices available. Food trucks served diverse items such as tacos, Korean barbecue and grilled cheese sandwiches, in addition to the selection of grilled foods, pizza and Indian cuisine.